Commercial truck accidents occur with alarming regularity on Nevada roadways, including in and around Law Vegas. Semi-truck accidents oftentimes result in serious injuries, when the collision involves a passenger automobile. Indeed, some of the most catastrophic roadway accidents in the United States involve large trucks, according to the Federal Motor Carrier Safety Administration or FMCSA. A person involved in a commercial truck accident needs to understand his or her rights and interests. This includes understanding possible compensation in a big rig accident case as well as appreciating the various parties that might be responsible for causing such a collision in the first instance. Compensation awarded in a commercial truck accident cases depends upon the facts surrounding the accident itself, coupled with the extent of injuries the victim sustained, according to Cornell Law School. With that noted, there are certain types of injuries, damages, and losses for which compensation oftentimes is sought following a commercial truck accident. These include pain and suffering, medical expenses, mental anguish, lost income, permanent disability, and property damage or loss. 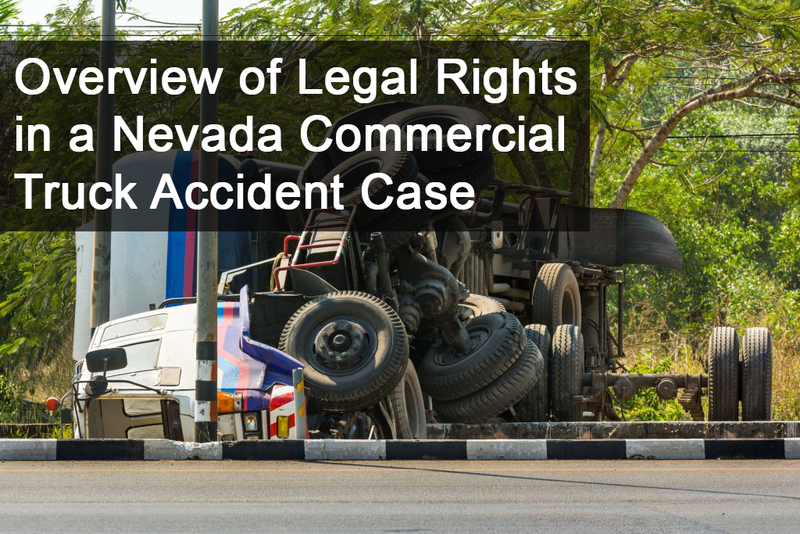 A skilled, experienced commercial truck accident attorney, like a member of the legal team at the Naqvi law firm in Las Vegas, fight to ensure an injured person receives comprehensive compensation. This includes money not only for existing losses, but for those that reasonable can be anticipated in the future. In the aftermath of a commercial truck accident, an injured person is likely to need ongoing medical care and treatment. He or she may not be able to return to work any time soon. Pain may persist indefinitely. All of these represent the types of reasonably foreseeable issues for which compensation is sought in a commercial truck accident case. Punitive or exemplary damages may also be awarded in a commercial truck accident lawsuit. Punitive or exemplary damages in a big rig accident case represents an award of additional compensation to an injured person. This money is awarded when the conduct of the party or parties responsible for a commercial truck accident is considered to be particularly reckless or egregious. Oftentimes in a commercial truck accident case a number of parties are deemed responsible for the incident. These parties include the big rig driver, the truck company or truck owner, the truck manufacturer, the truck maintenance provider, and the entity that least the vehicle to transport product. The specific facts of the case dictate which parties potentially will be held responsible in a commercial truck accident. A skilled, seasoned semi-truck accident attorney is in the best position to ascertain all of the potentially responsible parties in this type of case. A person injured in a commercial truck accident should be proactive in retaining legal representation. A Las Vegas commercial truck accident lawyer will schedule an initial consultation to discuss and evaluate a case. As a general practice, a Las Vegas commercial truck accident attorney charges no fee for an initial consultation with a prospective client.